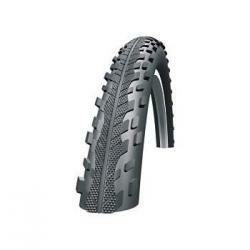 This tyre is best suited for trail riding and on cycle paths, canal toe paths and forest tracks, Great for commuters that need to go on and off road to get to work, while ideal for taking the family away on the weekend ride. This is a semi-slick fast rolling tyre that offers minimum rolling resistance without compromising stability. It has a diamond textured tread that gives great grip and optimal brake performance and is RaceGuard protected against penetration punctures.